Christmas is a magical time, it’s a time for friends and family. It brings back childhood memories of the super excitement, the build up waiting for Santa to come. In our house as kids, Santa prefered a bottle of beer to be left for him. We didn’t know any better and being Aussie we just accepted this as fact. I remember being devastated when a family friend told me, at aged 10, about the Big Guy secret. It was mean, and a rotten thing to do. Like stealing something magical away. I can still remember where I was and can still picture that very moment, some 34 years later! As I got older I insisted on believing again. I just do, it’s part of the magic. I’ve done my very best to make it special for my kids, the building up of the season, the letter writing, the going to see Santa to get a picture, they love it but I think it’s almost done in this house. Grand Master D is 12, he totally knows, although I’ve never admitted, I say to him don’t spoil it for your sister. He’s a beautiful boy, sensitive and sweet and would never ruin it for her and I know is secretly hoping it’s not true. I have always been super protective of both kids and their belief in Santa because I think it’s a special part of childhood. It makes me sad to hear parents say they tell their children he’s not real because they don’t want to lie. It’s not lying, it’s using your imagination and making childhood magical.There’s no harm in that, no child needed therapy because they believed their parents about Santa…or the Tooth fairy or the Easter Bunny. We still teach them the real meaning of all those holidays. I think there’s room for both. Miss Gremlin still talks about Santa but I think she’s almost done. She’s 8, and you know the kids at school have been talking….. She asks now and again and my answer is always the same….. ‘What do YOU believe?’ And that’s what’s keeping it for her, she wants to believe. 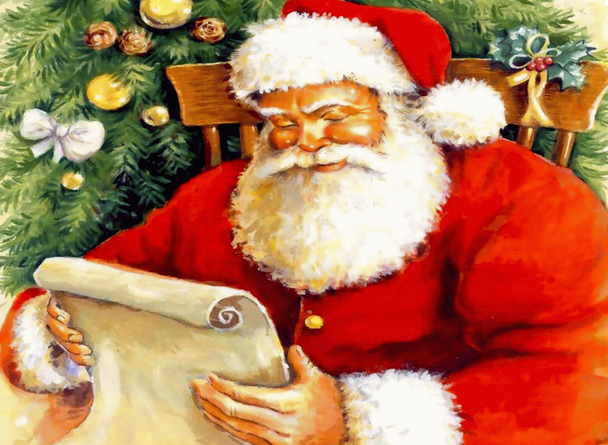 Who wouldn’t …… It’s way cool to believe a jolly old fellow flies around the world delivering presents down your chimney…..
To keep the dream alive here’s how we spend the lead up….. The weekend before we go Christmas tree hunting, and that is such fun, we get our saws and go on a hay ride out into the paddocks where all the trees grow, where we wander around finding the perfect tree. One year we saved the poor little crooked tree standing alone, rejected, because he wasn’t straight… we imagined him being so sad seeing all the other trees get picked, we just had to have him, that poor little spastic tree we called ST(H)eve (with a lisp). We could feel how proud he was being tied down to the top of our car, and we loved him all the more! On Christmas Eve after we’ve baked the cookies, we watch The Polar Express , with our hot chocolates and apple cider, then we read the Night before Christmas and The Aussie Night Before Christmas before setting out the milk and cookies for Santa…. Our Santa, who would surely prefer cognac, gets milk and cookies! Then they try desperately to go to sleep so the morning can come….. I think she knows the truth, our little Miss Gremlin, I think she’s worked it out….. but I’ll keep Santa alive as long as I can because of the wonderful magical memories I hold onto and I want my kids to have as well. Are your kids clinging to the last glimmers of childhood this year? Do your children still believe? Do you have special family traditions? I’d love to hear about your family traditions or childhood memories. Oh, I hope it’s not your last year! I don’t want that day to ever come here, but I know it will some day. My daughter is 7, but still believes very strongly. She says that kids at school say he’s not real, but she tells them that they are wrong. I have a feeling that she will believe for at least a few more years. I try to keep it very magical for her, and she really doesn’t question it at all. I hope the magic holds just a little longer for you. Even if she does figure it out, hopefully you can still keep the fun traditions! And we will always have those traditions…..
Say it isn’t so…? This left me hoping that my daughter believes until she’s AT LEAST 13. Or, I hope as That Suburban Momma’s daughter does, she doesn’t listen to the kids around her that say he isn’t real. Even after I found out, around 9, I still had a glimmer of hope that he was real. I still listened for the sleigh bells. Sometimes, I think I still do 🙂 By the way, I am now on comment luv thanks to you. My husband looked at your site over the weekend and then updated my plug-in…so, thanks! As for santa, she hasn’t asked this year but a mother know, you know…… Hopefully it’ll last a little longer. Aw, love this! Your house sounds like my house. I wholeheartedly agree with what you said – that magic is one of my absolute favorite things. I LOVE holiday traditions! This is the first year that my baby “gets” the whole Christmas concept. It is so wonderful to experience it through their excitement and anticipation. It is also terrific to have a “phone call to Santa” in my arsenal for when the kids are acting up! I think our Santa may prefer a beer to cookies as well! You should have seen my kids faces the year we did it! I sat Mum and Baba down with my list of reasons why I knew he wasn’t real and had a tantrum about how I could never trust them ever again. All of the mythical um creatures? Stopped that day. Tooth fairy, easterbunny.. oh but Derek the child spitter was still real.